About Denise Gard, Sienna and Joey! I have over 14 years of experience between being a professional storyteller, children's librarian, and school librarian. I reside in beautiful Colorado. I believe that oral storytelling brings a story to life. A story lives, breathes, and grows as it is being told to an audience. I always incorporate audience participation into my storytelling. Students and adults alike have enjoyed my storytelling workshops which emphasize teaching techniques such as inflection, accents, and body language. I love writing stories for my dogs, Sienna and Joey, to perform and hope to publish them someday as picture books. My favorite stories to perform are ones with strong characters, funny situations, and memorable dialog. Sienna is a beautiful red and white Border Collie who loves performing for audiences. Her favorite trick is playing dead and she does this whenever she needs a "break." Sienna loves treats (any kind), her mommy Denise, and belly rubs. And although, Sienna wears a lot of costumes, she still knows deep down that she's a dog--a very special dog! Sienna loves hiking and running with Denise, playing with other dogs, and being a diva. 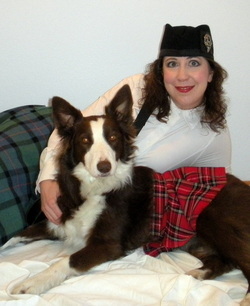 Joey, a blonde Border Collie, has now joined Sienna in performing at shows. He enjoys doing tricks, but his favorite thing is to annoy his sister, Sienna, by stealing her blanket and toys! He also loves giving hugs and kisses to audience members. If Joey could, he would play all day, run everywhere, and only stop when he collapsed. He may appear innocent, but he's always planning something!